The bright young engineers, aged 11-19, used computer coding to programme miniature remote-controlled four-wheel-drive vehicles they have designed and built for a two-day competition at the Yas Marina Circuit. One of the challenges saw the vehicles negotiate a demanding course that wound its way over and through Land Rover Discovery SUVs. K-EVO from Portugal were crowned 2017 champions; with Panthera, Malaysia and Fair Dinkum 4x4, Australia in second and third places respectively. 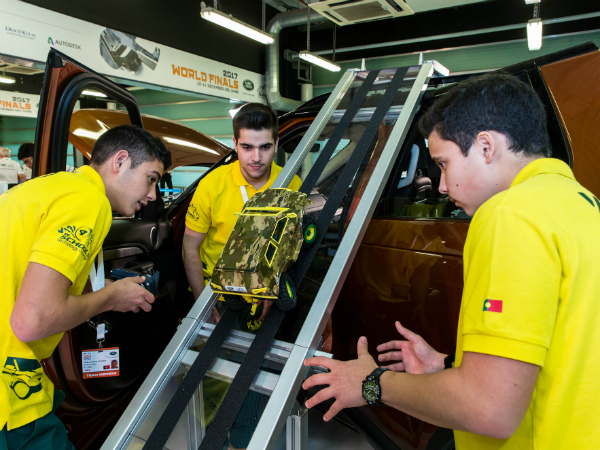 The winning vehicle features multi-link suspension, replicating the Land Rover Discovery, and was made using natural, modern and recycled materials such as biopolymers, plastics and aluminium which were a key consideration in the judges’ scoring. The UK’s leading investor in research and development, Jaguar Land Rover has launched a global initiative which aims to recruit more than 1,000 electronic and software engineers to its expanding business. In June this year, the company launched an innovative, mixed-reality recruitment app in collaboration with virtual band Gorillaz to find global future engineering talent. Keep your eyes peeled for future articles about the teams and people involved in the challenge. Click here to read more about world champions, Team K-EVO.